Nearly 60% of respondents are working on a reduced IP budget going into 2011. 45% of respondents filed more than half of their 2010 applications overseas, but in fewer countries. There was a resounding "Yes!" from U.S. patentees regarding support for a unified European patent system. 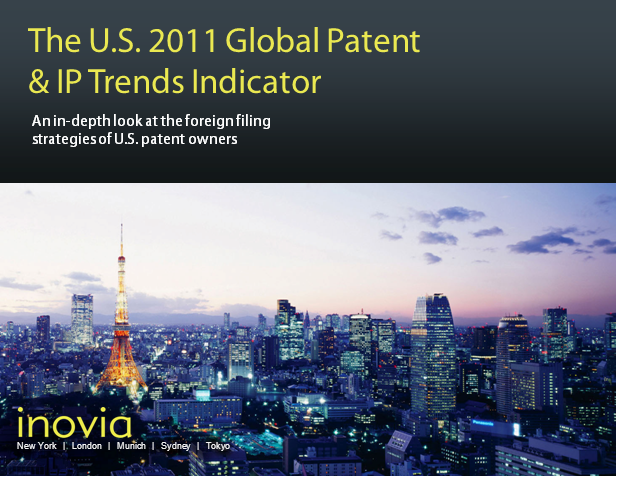 To receive a complimentary copy of the U.S. 2011 Global Patent & IP Trends Indicator, visit www.inovia.com/survey. - Nearly 60% of respondents are working on a reduced IP budget going into 2011. - 45% of respondents filed more than half of their 2010 applications overseas, but in fewer countries. - There was a resounding "Yes!" from U.S. patentees regarding support for a unified European patent system.